datacad.com -- Products: What's new in DataCAD 21? 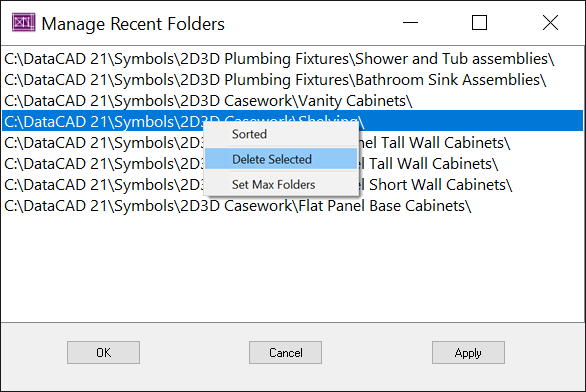 What's new in DataCAD 21? Thank you for your interest in DataCAD 21 As part of our dedication to continuous improvement and to deliver the highest quality CADD products possible, this latest upgrade includes your most requested enhancements. To get the most from DataCAD 21, please refer to the overview below. If you have any questions about DataCAD 21, contact our technical support staff at help@datacad.com. DataCAD 21 contains a collection of new features and enhancements designed to increase your productivity. The DataCAD 21 drawing file format is currently compatible with DataCAD 15 through 20. However, you must use the "Save As" command in the "File" menu to save files backward to older version formats. DataCAD 21 supports the ability to import and export AutoCAD 2018/2019 files in DXF and DWG format. 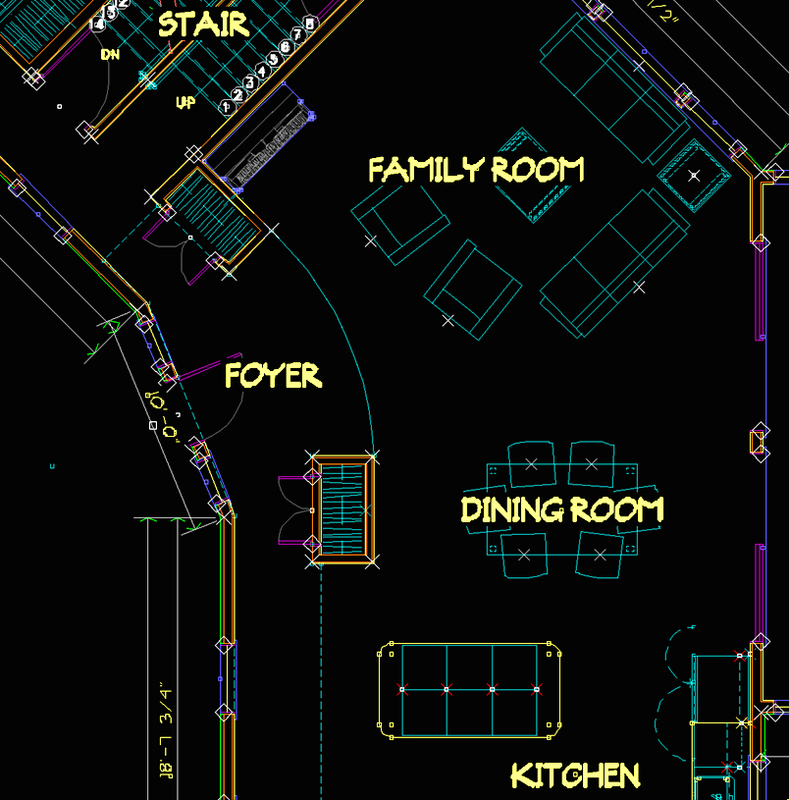 This enables you to collaborate and share files with associates who use the latest version of AutoCAD. DataCAD uses a software-based license management technology called a “Softlock.” Each license you purchase can be activated on only one computer at a time. However, you can move your license from one computer to another by deactivating it at one location and reactivating it at another. You can perform the deactivation locally from within DataCAD, or remotely through the DataCAD License Portal. 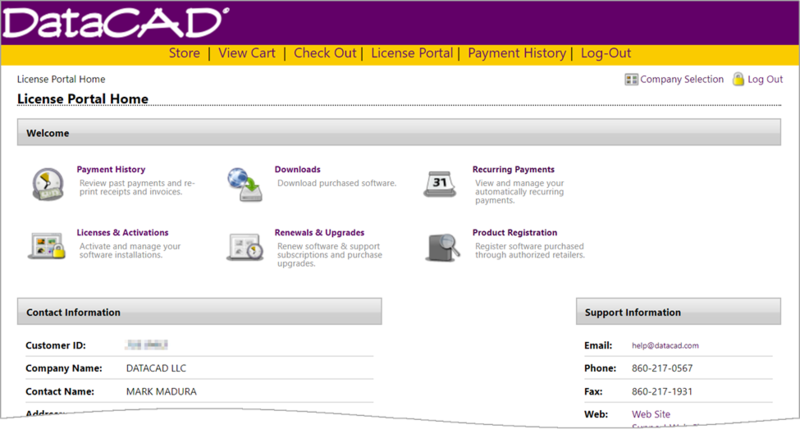 DataCAD's Softlock has been integrated with our Online Store. So, in addition to managing your license activations remotely, you can now renew your subscription or upgrade a license directly from your customer license portal. Your new License IDs and activation passwords are automatically-generated at the time you complete your order. 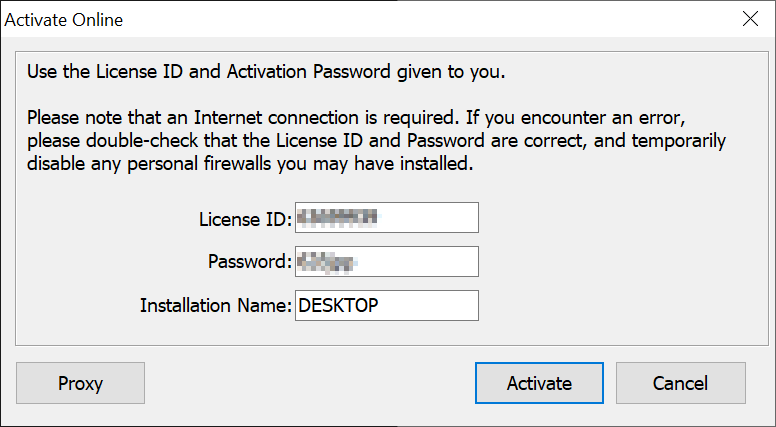 DataCAD 21's Activation Dialog remembers your License ID and Password after a successful activation. So, when you switch between your office and home computers, your license credentials will be readily available. An Installation Name field has been added to the Activation Dialog that allows you to associate your license with the computer it is activated on. This will help you identify the activation in your License Portal as this name appears next to the Installation ID. Figure 5: DataCAD's drawing window distorted by DPI Virtualization on a 4K display. A multitude of issues related to the display of DataCAD's drawing and program interface on high-resolution devices, such as 4K monitors and tablets, have been addressed in this update. In all, more than 100 dialogs, including the Layer Manager and the XREF Manager, are affected by these changes. Starting with Windows Vista, Microsoft introduced DPI Virtualization to automatically upscale (i.e., bitmap stretch) applications like DataCAD so that their interfaces would appear the same size on higher resolution displays. Until the recent introduction of hi-dpi displays like 4K monitors and tablets, stretching DataCAD's interface (dialogs and the drawing area) 125 - 150% wasn't detrimental. Even on a Surface Pro tablet running at 192 dpi, Windows did a fairly good job of upscaling DataCAD's menus and dialogs. In Windows 8.1, Microsoft introduced a way to disable display scaling on a per application basis. You could right-click on DCADWIN.exe (or the program shortcut), select Properties, go to the Compatibility tab and check Disable Display Scaling On High DPI Settings. This would prevent DataCAD from being scaled, and the draw form would be rendered at 1:1. Figure 6: DataCAD's drawing window displayed 1:1 on a 4K display. Disabling Display Scaling would restore the drawing area so that lines, text, and arcs were sharp. However, DataCAD's menus and dialogs would also be rendered at 1:1, so the interface would become too small to read. The size of toolbar icons and the menu font can be adjusted in Program Preferences, so the main interface could be corrected, but many other dialogs would appear too small. The Windows 10 Creator's update introduced a major change to the way the operating system and applications implement DPI Scaling. In some cases, this would cause DataCAD to 'shrink' on high resolution displays. Even changing the display resolution would not correct this since the native resolution is always used. With this update to DataCAD, the drawing area will always be drawn at the highest resolution possible, or 1:1 with the display device. Toolbar icon sizes and menu font sizes can still be adjusted the same way in Program Preferences. For dialog boxes, a new Dialog Box Size slider bar has been added to the Interface tab. DataCAD will query the current display and automatically set a recommended enlargement. You can change this setting by adjusting the slider bar position. Since most of DataCAD's interface is affected by these changes, we expect there to be anomalies we've overlooked. Please report any interface elements you find to be the wrong size to help@datacad.com. In the first implementation of Symbol Layer Control, whenever a Symbol was added to a drawing, its list of On/Off Layer Attributes were added to the symbol instance. This happened regardless of whether Symbol Layer Control was set to None, Per Definition, or Per Instance. In a drawing with hundreds of symbol instances, this created a lot of unnecessary overhead. Handling this data could significantly slow down File, Exit and Save, and saving a symbol from the Symbol Editor back to its parent drawing. Additionally, when Per Instance layer control was enabled, GoTo View Link Attributes were being added to symbol instances even when their GoTo View Link option was not enabled. This is no longer the case. Layer On/Off Attributes are only added to a symbol instance when Symbol Layer Control is set to Per Instance. These attributes will also be added to existing symbol instances when you switch Symbol Layer Control from None or Per Definition to Per Instance. If you switch from Per Instance to either None or Per Definition, you will be asked "Would you like to retain Per Instance layer control attributes?" Answer Yes if you intend to return to Per Instance layer control at some point. Otherwise, answering No will delete the now unused Layer On/Off Attributes from each symbol instance in the drawing. Also, when Per Instance Layer Control is enabled, GoTo View Link Attributes will only be added to those instances that have their GoTo View Link option enabled. This option is available in the Insert Symbol menu, Symbol Tools context menu, and the newly-expanded Symbol Layer Manager. Additionally, when a drawing is first loaded into this version and Symbol Layer Control is not set to Per Instance, DataCAD will delete the unused Layer On/Off attributes from each symbol instance in the drawing. This will slow down the loading of the drawing. However, it will only happen the first time the drawing is loaded and then saved. New options for Pitch, Angle, and Grade have been added to the 3D Inclined Polygons and Slabs Create and Edit menus. 1. Go to 3D Entity, Polygons or Slabs, Inclines. Note: For Pitch, any positive or negative Rise value is allowed. However, the Run value must be positive. For Angle and Grade, any positive or negative value is allowed. The minimum value must be non-zero. 4. Follow the prompts to enter the first edge of the polygon or slab. 5. Follow the prompts to enter the second edge or point of the polygon or slab. 6. Select New Pitch, Angle, or Grade to enter a new value for the slope of the polygon or slab. 1. Go to 3D Entity, Polygons or Slabs, Edit. 4. Select New Pitch, Angle, or Grade to enter a new value for the slope of the polygon or slab. 5. Toggle on Move Top to update the z-coordinates of all but the lowest (i.e. Eave) vertices of the polygon or slab. Toggle on Move Bottom to update the z-coordinates of all but the highest (i.e. Ridge) vertices of the polygon or slab. The x and y coordinates of the polygon or slab vertices will not change. 6. Select inclined polygons or slabs by Entity, Group, Area, or Fence. The Entity Properties Editor has been updated to include the Slope parameters of 3D Inclined Polygons and Slabs. When you display the properties of a 3D Polygon or Slab that is not horizontal or vertical and has at least one edge parallel to the ground plane, its slope properties are shown. When set to Pitch, the Rise and Run parameters can be changed. The maximum Rise value is +/- 685 units. The maximum Run value is 1000 units. When set to Angle, the angle, in decimal degrees, can be changed. The maximum angle is +/- 89 degrees. When set to Grade, the grade, in percent, can be changed. The maximum grade is +/- 5700%. When you change the slope parameters, DataCAD will update the z-coordinates of all but the lowest (i.e. Eave) vertices of the polygon or slab. Set Move Top to No to update the z-coordinates of all but the highest (i.e. Ridge) vertices of the polygon or slab. The x and y coordinates of the polygon or slab are always maintained. When Symbol Layer Control is set to Per Instance, a new Symbol Layer Manager option is available in the Symbol Tools context menu. Select this option to display the Symbol Layer Manager for the currently-selected symbol. 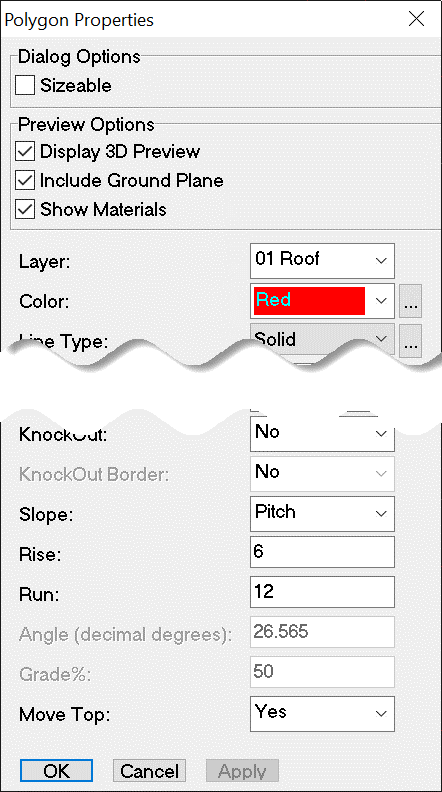 Layers in the list can be toggled on/off by clicking on them. An Info Tip is displayed next to layers that have View and/or Scale-independent attributes. Note: The Symbol Layer Control 'Off' setting supersedes the View/Scale-dependent Symbol Layer 'On' setting. So, if a symbol's layer is set to 'Off' by Symbol Layer Control, the layer will not display, regardless of its view/scale-dependent setting. The View/Scale-dependent Symbol Layer 'Off' setting supersedes the Symbol Layer Control 'On' setting. So, if a symbol's layer is set to 'Off' by View/Scale-dependent Control, the layer will not display, regardless if its layer control setting. In other words, if a symbol's layer is turned off by either method, it will not display. A new option, Open SLM (Symbol Layer Manager), has been added to the Insert Symbol menu when Symbol Layer Control is set to 'Per Instance.' When toggled on, the Symbol Layer Manager (SLM) will be opened when a symbol is inserted. A number of options have been added to the Symbol Layer Manager to give you greater control of the way On/Off Layers and GoTo View Links apply to symbol instances. Changing the On/Off Layers in the Symbol Layer Manager then selecting Apply or OK will set the On/Off Layers for the selected symbol instance. Apply To All Instances, can be checked prior to clicking the Apply or OK buttons to apply the changes to all instances of the selected symbol definition on the Active Layer. If Apply To All Instances is checked, the option, On These Layers becomes available so you can apply the changes to All Instances on the Active, On, or All layers. A GoTo Views section provides options for managing the GoTo View Links in symbol instances. 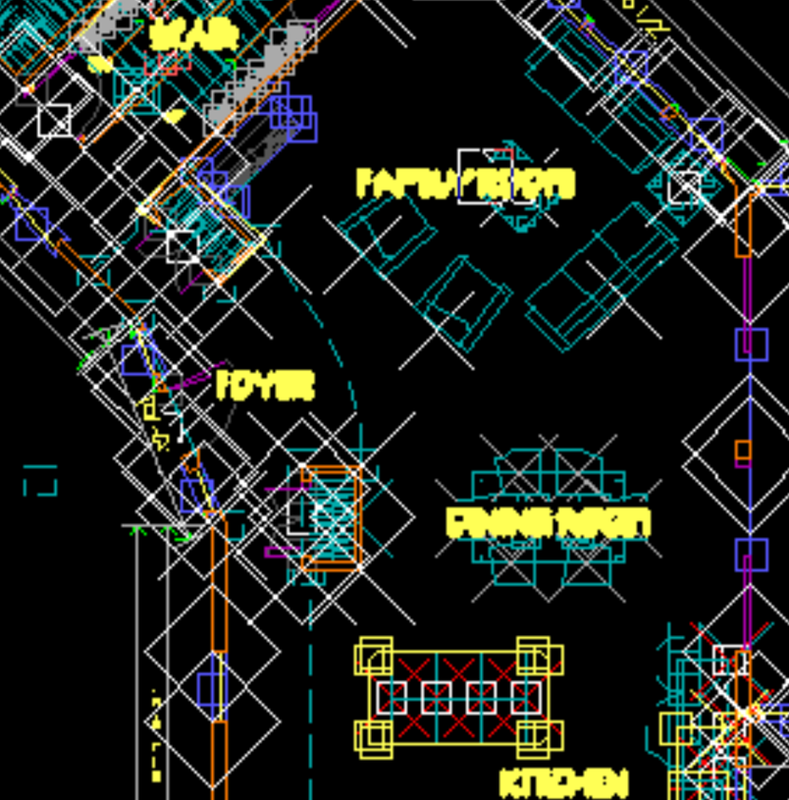 When GTV Link is checked, DataCAD will associate the symbol's On/Off Layers and clipping boundary with a GoTo View whenever it is created or updated. A drop-down list of the drawing's GoTo Views appears below the GTV Link checkbox. Selecting one of the GoTo Views from this list will set the On/Off Layers in the Symbol Layer Manager. Selecting Update will update the On/Off Layers that are associated with the selected GoTo View. Selecting Update All GTVs will cause the symbol to display the same On/Off Layers for every GoTo View. For convenience, there is an option, As Selected, in the GoTo Views drop-down list. Selecting this option will set the On/Off Layers in the Symbol Layer Manager to the way they were when you first opened the Symbol Layer Manager. Binding an XREF to a Symbol will copy the XREF's GoTo View links to the new Symbol Instance. If that key is TRUE, the "GTV Link" toggle will always be ON when the Insert Symbol menu is shown. Conversely if the key is FALSE, the toggle will always be OFF. If the key is present but left blank, the state of the toggle will be remembered. A GTV Link dropdown has been added to the Entity Properties Editor for symbols. This option is only shown if the current Symbol Layer Control is set to "Per Instance". When Per Instance layer control is enabled, a new GTV Link toggle is shown at F8 in the Insert Symbol menu and the Symbol Tools context menu. The GTV Link toggle in the insert symbol menu controls the state of a drawing variable that is used to set that property as symbols are inserted. The GTV Link property is per-instance and can be enabled/disabled on a per symbol entity basis. GTV Linking for Symbols works essentially as it does for XREFs. Changes have been made to allow you to add, delete, or rename layers in the Symbol Editor and have all its instances automatically update their local layer lists to reflect those changes. This, essentially, renders Symbol Tools, Layer Control..., Rebuild Layer List unnecessary when using Per Instance symbol layer control. Changes have been made so that Symbols using layer on/off settings that have been assigned with Symbol Layer Control set to Per Instance will not lose those settings when switching between None, Per Definition and back to Per Instance. 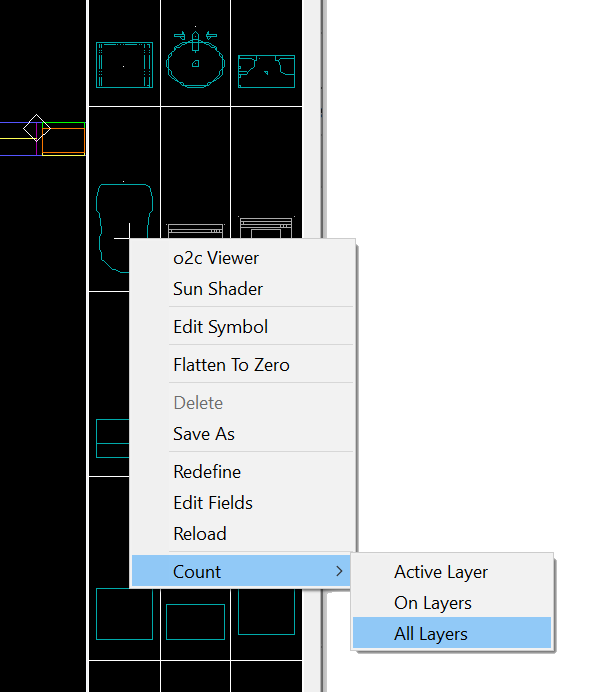 When exporting to DWG and Symbol Layer Control is NOT set to "None", DataCAD will use the On/Off layer settings in the symbol definition. If you select "All Layers" for DWG export, all the layers in the symbol will be exported, but the On/Off status will reflect the current state of the symbol definition. If "On Layers" is selected, only those layers that are On will be exported. A new option, Manage, has been added to the Symbol Browser's Recent and Favorite Folders menus. 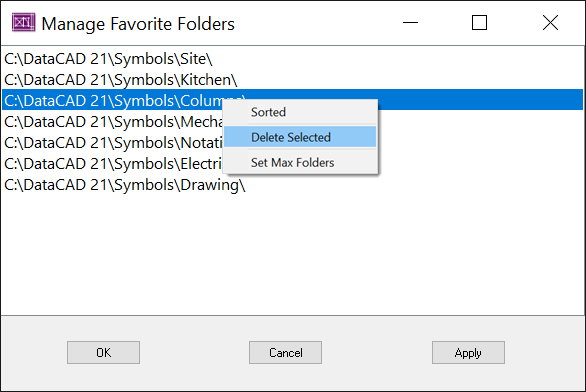 Select this option to display a dialog you can use to manage your list of Recent and Favorite symbol folders. Click on a single item to highlight it. Click and Drag an item to move its position in the list (only one item can be moved at a time). [Ctrl] + Click or [Shift] + Click to select multiple items. Press [Delete] to remove highlighted items from the list. Right-click to display a context menu with the following options. Select Sorted to alpha-numerically sort the list. When Sorted is enabled, the ability to move items in the list is disabled. Delete Selected is only available when items are selected. Select Set Max Folders to set the maximum number of saved folder locations (1 - 100). A new option, Exclude, has been added to the 2D and 3D Edit Menus; Move, Copy, Rotate, Mirror, Stretch, Enlarge, and Erase. Note: Exclude is not available in Rotate, Quick, and Erase, Partial; or if Dynamic is toggled (On). The Exclude toggle appears at F7 once you've begun the editing routine. For example, after you've defined the distance to stretch, toggle (On) Exclude, then click on entities you would like to exclude from Stretch. The entities you selected are highlighted. Click on a highlighted entity to remove it from the items to exclude. Right-click to return to the Stretch command. Perform the Stretch operation as many times as necessary. Toggle off Exclude to cancel and clear the Exclude selection. Exit Stretch; the Exclude Toggle and Selection will be reset. The following options have been added to the Destination section of the Extract Settings dialog for Pak-N-Go. By default, the contents of a Pak-N-Go archive are extracted to the folder containing the PAK file. 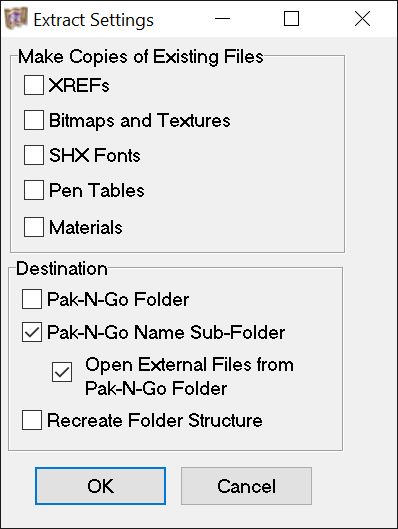 For convenience, the destination Pak-N-Go Sub-Folder has been added so the contents can be extracted to a sub-folder with the same name as the PAK file. Recreate Folder Structure extracts the contents of the archive to the original folders the individual files came from. A new option, Open External Files from Pak-N-Go Folder, has been added to the Pak-N-Go Settings dialog. This option is only available when the extract to destination is set to either Pak-N-Go Folder, or Pak-N-Go Name Sub-Folder. Use this option to force DataCAD to use the contents of the archive as it was saved. Otherwise, DataCAD will try to read the external files from their original locations, which may be different from the archive. A new Count option is available for Symbols and Smart Doors and Windows. [Ctrl] + Right-click on any Symbol or Smart Door / Window instance and highlight Count in the Context Menu. 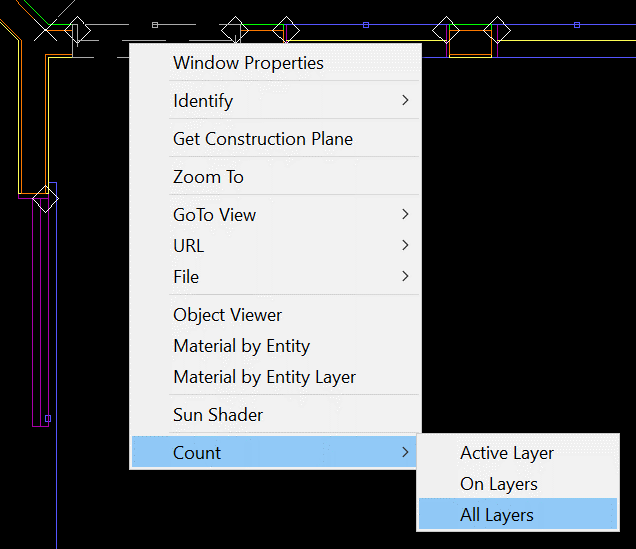 Select Active Layer, On Layer, or All Layers to query the count for all instances of that item. The results are displayed on the Attention Toolbar. For Symbols that have been loaded into the drawing, the Count option is also available in the Symbol Browser's Context Menu when browsing a folder or the current drawing. In the case of Smart Doors and Windows, instances of non-fixed width types of varying widths are tallied separately. So, the count will only include instances of the current type with the current width. A context menu has also been added to the item lists in the Smart Door and Window Managers. Right-click on any loaded Type to reveal the option, Count. Highlight Count and select either Active Layer, On Layer, or All Layers to display the number of occurrences of that Type. The results are displayed on the Attention Toolbar. Note: Varying widths of the same Type are counted together. •	Changed what is shown when selecting a renamed XREF for renaming in the Reference File Manager. •	Added a new radio group, Ignore CC, to the Reference File Manager. •	For renamed XREFs, the original path to the XREF is now appended to the new name, separated by characters, defined by line #6526 of DCADWIN.msg. 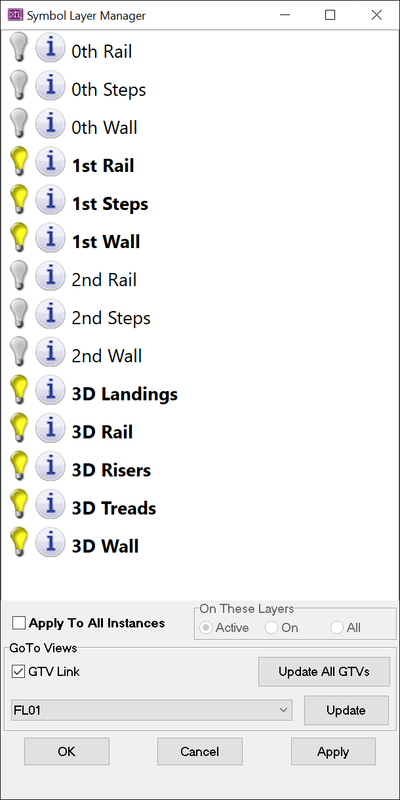 •	Added a horizontal scroll-bar (only when necessary) to the Types list of the Types Managers (Walls, Doors and Windows). Also, a hint is now displayed when the mouse is over a Type in the list. •	Changed Identify/Set All on an Associative Dimension to set the Show Dim Text drawing variable. •	New options have been added to the Clip Cube menu for incrementally adjusting either the x, y, or z coordinates of the Drawing Clip Cube. Note: These options only appear when Clip Cube is enabled. Use these options while viewing a clipped view to move the clip box 'through' your model. •	XREF Clips and Symbol Clips will now be clipped by the Drawing Clip Cube. If an X-Clip or S-Clip overlaps a Drawing Clip Cube, it will be merged with the Drawing Clip Cube. So, the portion of the X-Clip or S-Clip that lies within the Drawing Clip Cube will be displayed. •	X-Clips and S-Clips can be set to ignore Clip Cubes via a toggle in their context menu or within the X-Clip or S-Clip menus. Note: Drawings saved in versions of DataCAD prior to 20.02.03 will automatically have their X-Clips and S-Clips set to Ignore Clip Cubes when opened in this version. •	The current Base and Height setting for Clip Cubes is now displayed on the Error Line while you are in the Clip Cube menu. New options have been added to the AEC File Repair dialog. •	Flatten 2D Entities within Symbols (now a sub-option of Flatten 2D Entities). •	XREF and Symbol Insertion to Zero is now a separate option. Previously, this would occur automatically if Flatten 2D Entities was checked. Note: Covered Polylines are treated as 3D Entities and are no longer flattened along with 2D entities. Uncovered Polylines are treated as 2D entities and will be flattened along with other 2D Entities. •	[Ctrl] + Clicking on a Symbol will now open the Symbol Layer Manager if Symbol Layer Control is set to Per Instance. •	The key, Allow Trailing Spaces, has been added to the [Symbol Attributes] section of DCADWIN.ini. Setting this key to TRUE will prevent DataCAD from removing trailing spaces in Symbol Text Attribute values. •	Added Check Spelling to the context menu for Text, PText, MText, Symbol Attribute Text, and Symbols. •	Added the options, Half and Double to the Enlarge menu. •	A new option, Real-time Updating, has been added to the Persistent Layer Manager. If un-checked, the Layer Manager will only update its layer list when the dialog has the Focus. 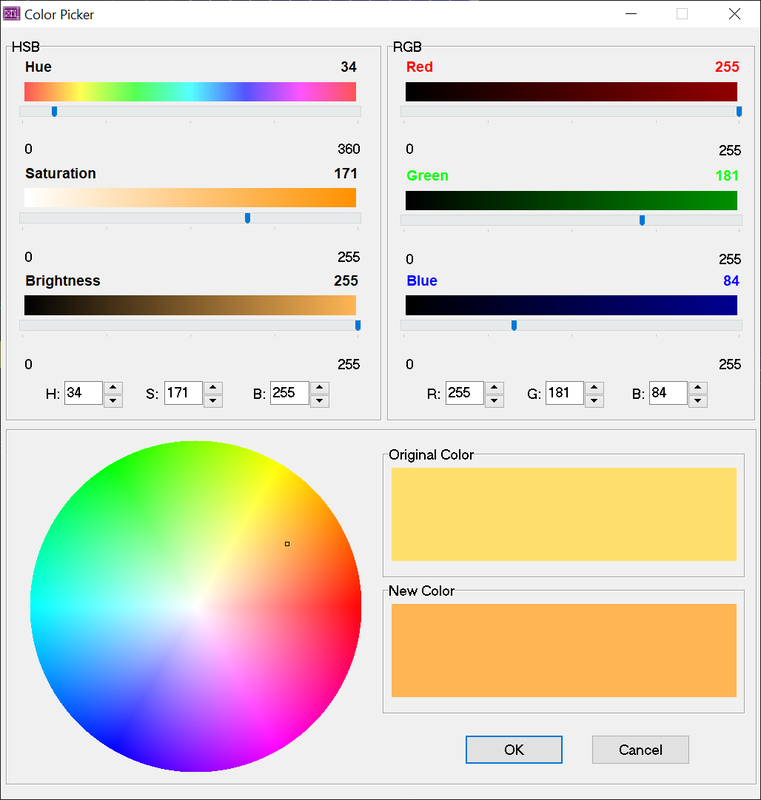 •	Added a new Color Picker/Mixer to replace the previous one. •	DataCAD's color drop-down combo-box will now give access to all 255 colors. •	Associative Dimensions and Smart Walls can be selected using the Entity method of Geometry, Divide. For Dimensions, the divisions are added along the dimension line. For Smart Walls, they are added along the Control Line. •	The Entity Properties Editor has been updated to show all unavailable options in a disabled state. So, only available options, based on the current settings, are shown. For example, a Text entity has KnockOut Border and X/Y Enlargement options. However, they will only be enabled if KnockOut is set to Yes. This way, you do not need to select Apply after setting KnockOut to Yes in order to see those additional options. Setting KnockOut to Yes enables those options automatically. •	As with GoTo Views, Multi-View Windows will now remember the current Tangents setting. •	A ‘Distance X 2’ option has been added to the 2D and 3D Move, Copy, and Stretch menus. Note: The appearance and position of this option is affected by the state of the New 3D Menu key in the [General] section of DCADWIN.ini. •	Added new options, Hatched, and Filled, to the Mask menu. These options are mutually exclusive. When Hatched is toggled (On), entities that are hatched will be selected. If Pattern is also toggled (On), only entities hatched with the selected pattern will be selected. When Filled is toggled (On), entities that are filled will be selected. •	Changes have been made to the way the z-coordinate is handled when you select an Insertion Point during Copy/Paste. Previously, the z-coordinate of the insertion point you defined was set at the current Z-Base. Now, the z-coordinate will always be set at zero. This is the same behavior as defining an insertion point for a Symbol. When you Paste, the Z-Offset sub-menu is now available if an insertion point has been defined. Note: To Paste using the Insertion Point, By Center must be toggled (Off). DataCAD 21 contains new configuration settings designed to improve program speed and functionality, while simultaneously improving productivity. After closing all drawings and then exiting DataCAD, open the "dcadwin.ini" file, located in the DataCAD 21\ installation folder on your C drive, to make changes. Note: You should make a backup copy of dcadwin.ini prior to editing, in case you need to return the program to its previous state. Extended character codes are used when programming icon toolbars and keyboard macros. When using any of the following new extended character codes, you will use the syntax V= for a toolbar button which executes just the one single command, A=10XX# in a toolbar button sequence that contains more than one command, or 10XX# in a keyboard macro. For more information on toolbar programming, see the topic “Creating Custom Toolbars” in Chapter 30 of the DataCAD Reference Manual. Load a material file (DMF Material by Color) by name. •	Header files for Delphi DX have been added. They are in the DCAL for Delphi\Header Files DX folder. •	A new sample macro, Edit_Group, has been added to demonstrate the use of the mode_group command. •	Sample macros are now included for Delphi DX in the DCAL for Delphi\Samples DX folder. •	All the sample macros have been compiled for DataCAD 21 and are available in the DCAL for Delphi\Compiled Macros folder. Note: This procedure was first added to DCAL for DOS in DataCAD 18.